Have you had enough of the traffic, technology and noise of everyday existence in the 21st century? Fortunately, South Africa has a wealth of destinations that offer true relaxation, solitude and opportunities to unwind. You can go so much further with cheap car hire and Kulula flight prices mean you get more bang for your buck when you fly to any of the major centres near your chosen destination. Let’s take a look at what your options are for off the grid experiences that bring real meaning to the word ‘getaway’. Nothing restores your karma like an escape to the African bush and camping is one of the best ways to reconnect with nature and rediscover self-sufficiency. Tsendze offers both permanent safari tents and rustic campsites for those who want to enjoy the atmosphere and amenities of the Kruger Park without the bustle of the main rest camps. Secluded in the northern part of the park near Mopani camp, Tsendze is a small camp with communal ablutions featuring gorgeous outdoor showers and shared kitchen areas. Apart from that, you’re on your own. There is no electricity and you need to bring your own gas and firewood for light and cooking. Hot water is courtesy of solar panels. The camp is fenced but you will have the thrill of dealing with opening and closing the camp gate yourself every time you venture out on a game drive. 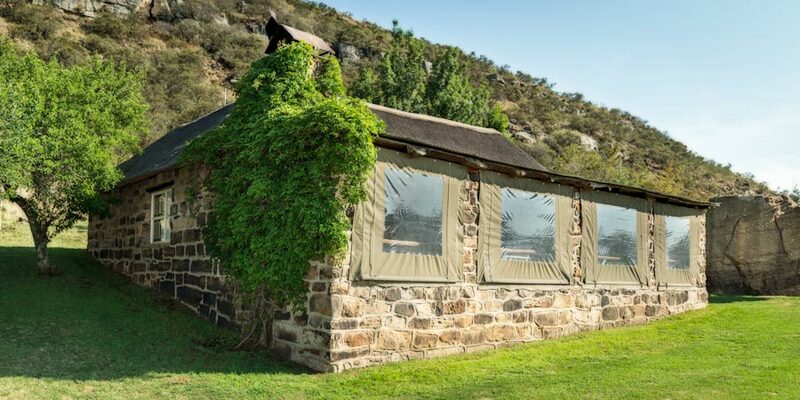 For a truly wild time, book a night at the Shipandane Bird Hide nearby and spend the night braaing under the stars before falling asleep to the sound of the river dawdling past just metres away. Located at the foot of the southern Drakensberg with clear views of Rhino Peak and Garden Castle, this campground is a hiker’s best dream come true. There are only 10 camp sites secluded under a stand of gum trees, a river runs through it and the only luxuries include a communal gas freezer, two-toilet ablution block and gas-powered showers. The amenities may be slim but the opportunities for hiking are vast. Explore caves and valleys, walk along the Mlambonia River and take a dip in Mermaid’s Pool. There’s more than enough room for exploration to keep you satisfied for a few days or more at Hermit’s Wood. Not keen on camping? keep reading. If you’re not willing or able to hire camping gear for your trip, you can rough it in relative comfort while maxing out the solitude and serene views. Die Hell is heaven on earth for those seeking a scenic escape. These dinky self-catering houses were built by the 1830 settlers and have been refurbished with modern amenities like solar power and gas. What hasn’t changed is the silent beauty of the Gamkaskloof Valley, the abundance of birds, ancient rock formations and gorgeous Karoo vegetation. You’ll need a 4×4 to make the 2-hour drive from Oudtshoorn to travel the seriously unbeaten track to Die Hel and need to bring your own fuel along too. Famous for its star-studded skies and quiet ambience, this little hideaway sleeps 6 people. The rock-clad dwelling melts into a hillside overlooking a small valley and has a built-in braai, lounge and fireplace to ward off the Free State’s winter chill. You’ll need a 4×4 or high clearance 2×4 to reach this mountain getaway. There are over 350 bird species resident in the area and hippos lounge in the many oxbow lakes of the floodplain. Your family dog is welcome to come along to enjoy the many hiking trails with you. Lanterns, lamps and gas are provided in lieu of electricity. If you’re even more reluctant to relinquish the apron strings of civilisation, South Africa offers plenty of luxurious off the grid options too. At first glance, you’d never think of this beach beauty as an off-the-grid destination. This 4-bedroom oceanfront house is rated 5-star and has every convenience you could desire, as well as a butler to see to your every need. It’s all solar-powered though and a testament to just how luxurious eco-friendly accommodation can be. Morokuru is an exclusive use villa and perfect for family time or a private getaway with close friends. This solar-powered wildlife paradise is located in the prestigious Thornybush Private Nature reserve and offers luxury tented camps, full-catering, game-drives and sophisticated service. It’s the perfect escape to the bush without having to worry about a single thing. Although your every desire is met and even exceeded here, you’re still far from the stresses of civilisation and given plenty of time to yourself. While going off the grid is synonymous with making your way off the road less travelled, it’s easy to get around with all the leading South African-Airlines providing flights to the main airports near these secluded destinations. Start planning your perfect escape when you compare airfares and do your online flight bookings here. This entry was posted in Airlines, Best Places in South Africa, Car Rentals, Destinations, Kulula Flights, SAA Flights, South Africa Flights and tagged cheap car hire, Kulula flight. Bookmark the permalink.